Despite playing his entire 20-year MLB career with the Houston Astros, earning seven All-Star Game appearances, four Gold Glove Awards, five Silver Slugger Awards and collecting 3,060 career hits; Craig Biggio still wasn’t able to get enough votes in 2013 to be a first-ballot Hall of Famer. 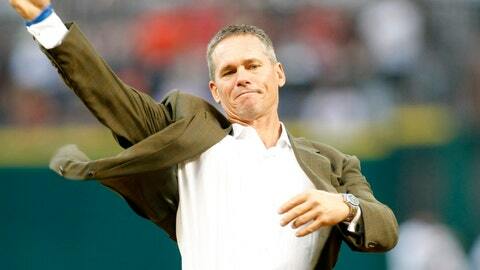 In 2014, Biggio will be on the MLB Hall of Fame ballot once again, and a group of his fans are wanting to make sure their beloved, retired Astro doesn’t get passed over for a second-straight year by making a video reenacting some of his ‘lesser-known’ accomplishments. According to the video, Biggio has been quite the busy ‘Killer B’ since his retirement from the Astros in 2007, keeping occupied by saving a woman from a tornado, protecting children from having nightmares, filling in for a missing band member during a gig, stopping a robbery, and, most importantly, stopping a zombie-apocalypse with nothing more than his baseball bat. Biggio’s career accomplishments alone should eventually land the former Astro great a ticket to Cooperstown, but with these new achievements coming to light, voters might want to remedy last year’s mishap and give No. 7 a plaque in the Hall of Fame.